A blog especially a tech blog, has a wide range of topics that it can cover and the tagging posts can make it easy to categorize posts even further, but the default way to display categories, tags and archives is to list them one by one, as a drop down or customize the display like splitting the category listing into 2 columns. Another very interesting way to display the categories is a cloud with varying font color and font size based on the popularity of the tag, the tag cloud can also be customized.Configurable Tag Cloud is a WordPress plugin that lets users insert a tag cloud with post tags, categories and with a degree of customizations. 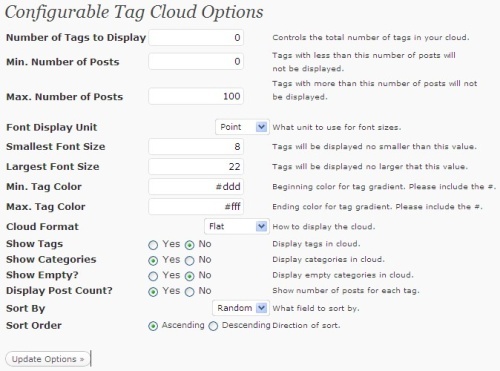 The tag cloud can be limited to shown tags in the cloud by the number of posts they are attached to, number of tags to display, font size, include/ exclude to display tags, categories and show empty categories in the tag cloud.The plugin settings can be configured from Settings –> CTC. < ?php ctc(); ? > – and would display a cloud using the options set in the CTC Settings page. Download and Upload the folder to you wordpress plugins folder and activate it.